three. And yet Casper’s customers are spoiled for choice at the till. Those who cannot afford to pay with a debit or credit card, or PayPal, can pay by instalments over six to 12 months. Those who make payments on time can enjoy the service free. Such “point-of-sale” loans, which have been around for decades in one form or another, are becoming increasingly popular in America. Consumers who might previously have financed big-ticket purchases such as furniture, electronics or home-improvement projects with a credit card are now opting to borrow at the checkout, often with an initial 0% interest rate. These short-term credit products were once the domain of big banks like Wells Fargo, which finances consumer purchases, and Synchrony Financial, an issuer of store-branded credit cards. Now tech startups are entering the market with innovative techniques for underwriting and approving potential borrowers, often in seconds. Demand is driven, in part, by younger consumers. Many young Americans tell pollsters that they dislike big banks. And they seem to have been scared off revolving credit by the financial crisis; according to the Federal Reserve Bank of St. Louis, those aged 20-35 hold about a third less credit-card debt than the same age cohort did in 2001. But they are willing to borrow over a fixed term for specific purchases such as a phone or car. Some traditional banks have piled into the point-of-sale market. In 2015 Citizens Financial Group, a regional bank, began providing instalment loans to customers upgrading their iPhones at Apple stores. Its portfolio of such merchant-financing loans grew from $700m to $1.2bn over the past year. Millennials toting iPhones are not the only ones borrowing more. 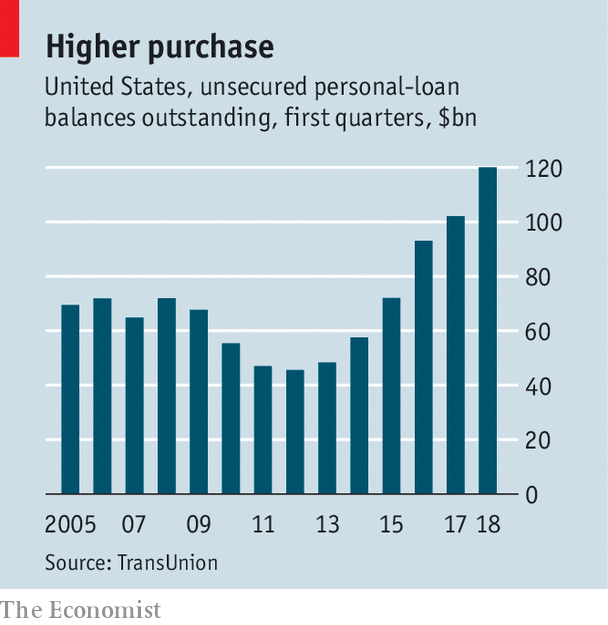 In the first quarter of 2018, personal-loan balances in America surged by 18% year-on-year to $120bn, according to TransUnion, a credit-scoring firm (see chart). Credit-card debt, meanwhile, rose by just 6%. Some new entrants offer credit mainly through online merchants. Many target affluent youngsters with simple borrowing terms and partnerships with high-end brands. Affirm, an online lender based in San Francisco, was founded by Max Levchin, who co-founded PayPal. It has agreements with 1,500 online retailers, including Nest, which sells smart thermostats, and Peloton, which sells internet-connected exercise bikes. Affirm’s loans, which typically range from $500 to $5,000, tend to carry higher interest rates than traditional credit cards. But the firm says borrowers end up paying less because they are not subject to hidden fees or compound interest, and have a set pay-off date. Its figures suggest that merchants using the service see revenue increase by 7-12% thanks to shopping baskets that are bigger and less likely to be abandoned before checkout is complete. Other lenders partner with brick-and-mortar sellers. GreenSky, an Atlanta-based lender founded in 2006, arranges financing for home improvements, elective medical procedures and other pricey items. Rather than lend the money, it matches merchants like Home Depot with banks like SunTrust and Regions Financial to finance their loans. Loans are arranged face-to-face by the retailer or contractor making the sale, cutting the risk of fraud. GreenSky, which makes money by charging fees to both merchants and banks, earned $326m in revenue and $139m in net income in 2017. It went public in May and is now valued at $3.5bn, making it America’s fourth most valuable fintech company. Investor enthusiasm for online lenders can be fickle, however. LendingClub and OnDeck Capital, two lenders that went public in 2014 promising to shake up the banking industry, have struggled with high sales-and-marketing costs, and difficulty finding cheap and stable funding for loans. Since its initial public offering, LendingClub’s share price has fallen by 82%; OnDeck’s has dropped 76%. Neither company turned a profit in 2017. GreenSky, which bills itself as a technology company rather than a lender, hopes to fare better by partnering with traditional banks rather than trying to beat them at their own game. That may not be as striking as the strategy of other fintech startups. But it has the advantage that it is already profitable. This article appeared in theFinance and economicssection of the print edition under the headline"Buy now, pay later"